Atrazine is the second most commonly used herbicide in the United States. Tyrone B. Hayes, an American biologist and professor of Integrative Biology at University of California, has warned about atrazine for years, purporting the herbicide is responsible for feminizing amphibians. Syngenta, manufacturers of Atrazine, ran a smear campaign against Hayes, attempting to discredit his reputation. Recently, the Environmental Protection Agency (EPA) released a 500-page draft report on the environmental reverberations of atrazine, vindicating Hayes’s research. This isn’t the first time the EPA has reviewed atrazine but it is the first time the agency deemed the herbicide as a risk to birds, mammals, frogs and plants it was not intended to destroy. 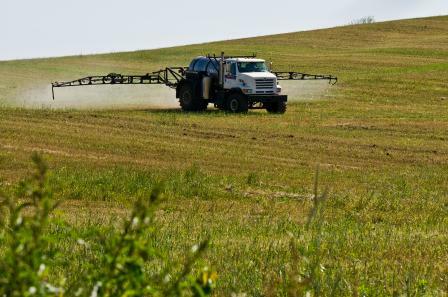 Since the chemical was first reviewed in 2003, a body of evidence has surfaced demonstrating that atrazine is now widespread in the environment and could endanger plants and wildlife. At the forefront of this research is Tyron Hayse, who has been publishing studies on the adverse effects of atrazine for years. He has argued the chemical acts as an endocrine disruptor, which hinders the sexual development of amphibians, such as frogs. After his first study of atrazine was published, which was originally funded by Syngenta, Hayes said the company launched a campaign against him, trying to destroy his professional reputation. The report, published Thursday by the EPA concluded, “This risk assessment concludes that aquatic plant communities are impacted in many areas where atrazine use is heaviest, and there is potential chronic risk to fish, amphibians, and aquatic invertebrates in these same locations.” What is ironic is that the EPA cited the work of Hayes, along with other researchers, about the impact atrazine can have on the sexual development of amphibians, including producing “gonadal malformations” that Hayes documented. It is not known what will be done in the wake of the assessment. Atrazine was first approved in 1958 but has provoked concerns about its environmental impact for years. As a result, the herbicide has been banned from Europe. The long-term adverse health effects of the herbicide include reproductive, developmental and hormonal problems. The EU (with Help from Germany) just made Monsanto’s day. A majority of EU governments voted on Monday to extend the European licence for glyphosate, the active ingredient in Monsanto’s flagship product. Roundup, for another five years. One of the deciding votes was cast by the caretaker government of Germany, …………. This decision was made despite a petition was signed by more than 1.3 MILLION citizen-subjects calling on a ban of the weed killer. The five year extension is welcome news to Monsanto ………..
ME: How convenient that the European Union exists – the establishment has 28 member nation states to cast a power vote in the direction of it’s best interests & those of its allies.